Imagine being trained to do a job and then having to wait a year to apply it. That’s how long Charlotte Maier had to wait to unleash Annette’s projectile vomit and tackle her on-stage husband as Veronica as the female standby in the Tony-winning play God of Carnage. The life of a standby (different from an understudy, in that there isn’t even an ensemble role to play) is a true waiting game. Yet in between mystery novels and balancing her checkbook backstage, Maier says she’s received master classes in acting by observing the actors she covers. A Chicago native, Maier began her career at the Steppenwolf Theatre Company. 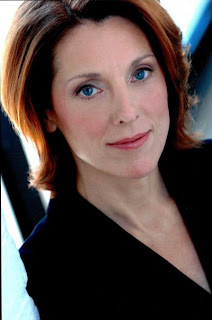 She moved to New York and started a family while appearing in Broadway plays in understudy and standby roles since 1993. She has acted in films with Steve Martin, Sandra Bullock, and Drew Barrymore, and Carnage marks her tenth Broadway production. The producers of Carnage announced Monday that the Tony winner for Best Play would close on June 27. Of this news, Maier remarked that the cast and crew felt lucky to run for a season and a half—a rare feat for a straight play. “Now we pass it on to the next cast in the next city.” Despite this news, Maier remains grateful—and why shouldn’t she? She learned how to vomit with the use of a hose. How many times have you gone on in Carnage? Twice. Fifty-two weeks had passed and I knew I was going to go on for Christine Lahti, but Annie Potts had broken her rib in the show somehow. So Thursday night, February 11, I went on for Annie after being with the show for a year. Two days later, I went on for Christine. Didn’t go on before and haven’t gone on since. What was that first performance like? That’s the part of Annette, the one who throws up. Technically speaking, that’s a very difficult part. For the vomit trick, you’re hooked up to a hose and there’s a hookup in the couch. I had never had a rehearsal doing that. We never did it on stage ever. But we did it in a sink off stage once before. So that night, we tried it in the sink again, but that’s nothing compared to what it’s like in front of a thousand people. With this play, if that trick doesn’t work, that’s a big problem. That made me nervous. Did it make you, you know, want to throw up? It made me want to throw up! It did, it did! It made me so nervous, which actually fed the part beautifully. Has the vomit trick ever not worked? Yes, it has not gone off. I guess each cast has had a night or two where it hasn’t worked. It’s very disconcerting and it’s really hard. The actress playing Annette does have a backup vomit in her purse, if it doesn’t work. But it’s very hard to get at and it’s complicated. You’re understudying some pretty recognizable actresses. How does that make you feel? I think it is a little intimidating, but in a very good way. Whoever you act with, it makes you a better actor. When I did scenes with Steve Martin in The Pink Panther, it made me a better actor because he’s so incredibly good at what he does. That’s how I feel with all these people. But you always have that moment where you wonder, “Is the audience going to ask for their money back if somebody’s out?” But that didn’t happen to me. It does goes through your head though. Will they be terribly disappointed? Will I have to win the audience over? People are usually disappointed when understudy cards fall out of a Playbill. What are your thoughts on that? I feel like, “Come on guys. I’m going to be good in this. It’s OK.” After two seconds, the audience is calm and it’s fine. But there is no doubt in your mind that that makes it harder. The women I am standing by for now—definitely, people have come to see them, and not the play, necessarily. It is hard, psychologically. What does your family think of your standby status? My 13-year-old son said to me, “Well, you’re as good. You just never got your big break.” That’s how he puts it, which is sweet. It’s really hard to make a living by acting. My husband is very grateful that I’m willing to do this, because you could say, “I don’t want to be an understudy. I want to do it myself.” There are moments when I feel like that. I feel very [groans] “I want this part to be mine.” But you make a living. There’s something incredibly liberating about it being a job, instead of it being about me and my value. I say, OK, that’s what I’m here for. I’m here to keep the curtain up. Do you have nights where you’re feeling really good and you think, “I am SO in the mood to KILL IT tonight!”? What do you do when you’re not on? What’s the standby life like? I’m really lucky. For one, it’s interesting to watch the play. The backstage people are spectacular. They’re people you love to talk to. It’s just great. You can knit. You can read books. Suddenly, it’s like, “Wow, I can have an hour and a half that I didn’t plan on having!” It’s actually pretty OK. Also, the squawk box is on, so you hear the play throughout the entire backstage. It’s piped in everywhere, including my dressing room. Sometimes I do think, “Oh damn. I would have liked to have done it tonight.” And then other nights you’re like, “Phew! God, I had a terrible day. I’m not feeling well.” Because we can’t get sick. We really can’t! What happens if you’re really sick? I don’t know. It’s never happened, that I know of. You just make yourself go on. Things happen all the time. People put their contact lenses in and scratch their corneas. They can’t go on. Crazy things that you just can’t predict. Like Annie breaking her rib. Who in the world would have thought, someone’s going to break their rib? Things happen. There have been moments when people have started the play not feeling well, having the flu and thinking, “I’m not sure if I’m going to make this performance.” There was actually a performance where I sat completely dressed—hair, makeup, everything—in case the actress couldn’t get through the show. They were going to make the announcement, “Excuse me. We’re going to start over,” and I would have just walked out and done it. You went on for the first time 52 weeks into the show’s run, and from the routine you just described, that’s a lot of down time. For a while when I was doing this play with the original cast, those people were so good and they really weren’t going to miss, I just thought, “This is crazy. I’m getting paid all this money—why?” And somebody said to me, “Do you know how much money they’d have to give back if you weren’t here?” It is so worth it, to hire somebody of a high caliber. Because when I went on, I knew they were exactly right. We standbys really are essential, because the curtain will not stay up without us. Have you ever felt like your talent was going to waste? I wouldn’t put it like that. No. There are particular skills you need to be an understudy. I have a lot of those. How I see it is: I don’t have to leave New York. I’m not a big star. But I have a family. I get to live in the city that I love with my husband and my son. And I make a very good living. I don’t see it as I’m being denied. Instead of having to be a waitress, I use all of my acting skills all the time. And I get paid very well. I also learn so much from watching people. I am a better actor because I have had a master class in acting from everyone from Helen Hunt to Jill Clayburgh to Janet McTeer. What kind of relationships or connections do you have with the actors you understudy? Marcia Gay Harden and I definitely talked about the role of Veronica. She was unbelievably forthcoming about it. I’ve definitely talked to other people about it, but I did the most with her. She’s somebody who never ever stops. Literally, the last week she was in the play, she was still taking notes and figuring out moments. She would say to me, “What do you think about this? You’ve been rehearsing it. How do you feel about this moment?” And that was really nice; I felt like it showed a great respect for me. Today’s understudies are tomorrow’s Broadway stars. What are your thoughts on this notion? I don’t know if that’s true. [laughs] But I have never stopped liking the work that I do. I’m not going to stop now. What I do is very specific and necessary. Take Mary Stuart, Lend Me A Tenor, Collected Stories—those are four plays where women my age are expected to step up and be a star. You can be a really good actor but not know what that is. I know what that is, to have that energy and move into that play. I love the title to this article! That was intense. Those are some tough questions that I would be afraid to ask an understudy, but knowing the answers is fantastic. Her comments felt very raw, I hope she does get to go one at least one more time before it closes!